Is it just me or have there been loads of new foundation and concealer launches recently?! New complexion products are my absolute favourite to buy and try, so definitely no complaint here! An ever expanding foundation/ concealer market can only ever be a good thing too, no matter what your skin concern and colour/ coverage/ finish preferences, there’s something out there for you! 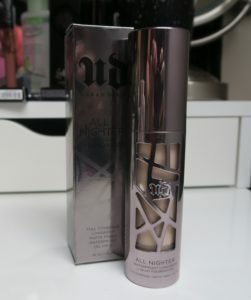 Urban Decay’s latest offering, the new All Nighter Liquid Foundation (launching 1st September in store and online at Debenhams*) is an eagerly anticipated thing in the makeup/ beauty world and following the popularity and now cult status of the All Nighter Makeup Setting Spray (Available from Debenhams*) I can see why! I was so excited to get my hands on this…as a new foundation junkie and because of all Urban Decays amazing claims! So here’s a bonus blog post for your eyeballs! We all know I love good packaging…can we just take a moment to appreciate it’s beauty, ha ha! The All Nighter Liquid Foundation comes in a sleek, edgy, metallic gunmetal bottle with an asymmetric cut out design on the front, which not only looks really cool, but practical too…you can clearly see the shade of the product inside and can keep tabs on when you’re running out! It has a built in airless pump, which means you can get every single last drop of product out with ease and hygienically dispense the perfect amount, every time. It comes in a 30ml size, which is pretty standard for a foundation and will retail at £27/ €32, which again, for a high end foundation is a normal enough price. It’s actually the same price as Urban Decays lighter coverage Naked Skin Foundation (Available from Debenhams*) which in my opinion, is a great option for those of you were full coverage just isn’t your thing. The All Nighter Liquid foundation diffuses light to blur any flaws and to give your skin a beautifully perfected finish. It gives you a flawless look, but still looks likes skin! Because of the high level of pigment, you only need the smallest amount of product and with no need to build up coverage (even though you can build it if you felt you wanted to…I tried for the sake of a proper test, ha ha, but you really don’t need to!) and add additional layers, it does feel light and comfortable on the skin. I wouldn’t generally wear makeup to swim or gym or anything to properly test its waterproof claim, however, it’s survived a windy, eye watery (ugh, bane of my life!) walk at the beach, full days of doing makeup in the current hot and sweaty (nice!) weather and a bit of Welsh stormy rain, so in my opinion, yes, waterproof, yes long wearing, I’d definitely agree there! I’ve tried applying it with a damp beauty sponge (like the Real Techniques Miracle Complexion Sponge – Available from Boots*) and although it did apply well, I found it sheered the product out a bit too much for my liking when I’m in a fuller coverage mood (this may actually be advantageous to those of you preferring a sheerer coverage but still with all day wear though) and found I get a better coverage and really smooth, flawless application with a foundation buffing brush. One of my favourite features of the Urban Decay All Nighter Liquid Foundation is that you don’t have to set it with powder. I always set my under eye, but apart from that, even though my skin can get a bit oily through my t zone, I only need minimal powder on my nose and even without, I still don’t get the level of shine break though that’s normally inevitable which pretty much any other foundation. This makes it feel even lighter on and my other complexion products, contour, bronzer, highlight etc, still go on smoothly over the top. I’ve worn this with and without primer, both ways look and feel great applying…I just find it wears slightly better with, especially on my nose, were I do have larger pores/ oiliness, towards the end of the day. The only thing I’d say, same as for any full coverage with high pigment content really, but even on combination/ oily skin, make sure you’ve moisturised well as these types of products can make the skin dry/ feel tight. I don’t find this too much of an issue with this foundation anyway, but then I always moisturise! The new Urban Decay All nighter Liquid Foundation will be available to buy in Debenhams, UK and Ireland in store or online* from September 1st 2016! I really like it so far! Go get yourself a sample down at your nearest counter and check it out for yourself…let me know what you think!